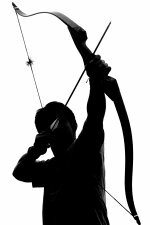 An arrow can only be shot by pulling it backward. So when life is dragging you back with difficulties, it means that it’s going to launch you into something great. Don’t let your determination waver. So just focus, and keep aiming. Stay strong and keep your eye on the goal. This entry was posted in Just me and tagged direction, dreams, goals. Bookmark the permalink.